Rents are going up all over the city. The average rent in Chicago for a 2-bedroom apartment is $1600 and a 1-bedroom is $1550. After Rogers Park, Uptown remains the north lakefront community with the second-lowest median rents. (The map shows only areas north of and including the South Loop.) The median rent here for a 2-bedroom apartment is $1680 and the median 1-bedroom rent is $1300. 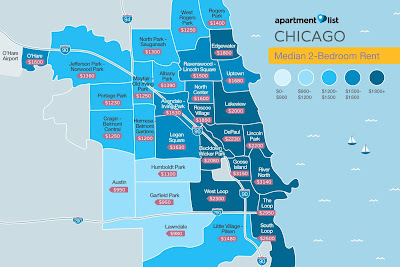 By comparison, a 2-bedroom in Edgewater averages $1800; a 2-bedroom in Lakeview goes for $2000. Uptown's rents rose an average of 6% over the past year, the steepest increase in the city (average for the city was 2.5%.) Rogers Park's rents rose 5.3% over the same period. As you go west from the lakefront, rents decrease (for the most part). A 2-bedroom in North Center goes for $1600, and a 2-bedroom in Lincoln Square goes for $1500. A 2-bedroom in Old Irving Park averages $1250 and one in Portage Park averages $1230. South Side communities are far more affordable than most North Side communities, even those located on the lakefront. The average rent for a 2-bedroom in South Shore is $890 and a 1-bedroom is $700 (prices rose 3.9% last year). In Lawndale, a 2-bedroom averages $980. The most expensive place to rent in Chicago? River North, where the average 2-bedroom place runs $3140 and the average 1-bedroom rents for $2200. Most expensive metro-area city to rent in? Evanston, where the average 2-bedroom goes for $2170 and the average 1-bedroom rents for $1870. 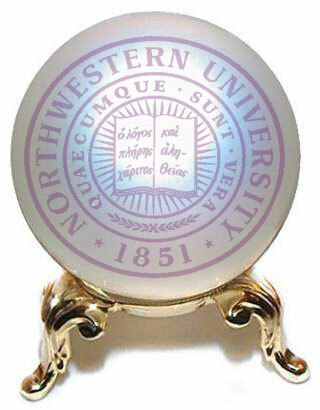 Crystal Ball Time: With a new Purple Line express station going in at Wilson by year-end, and many rental units of transit-oriented development being built right by the station, expect to see Northwestern students take advantage of Uptown's comparatively cheaper rents by living here and using the Purple Line to commute to classes. Why is Evanston so expensive? One reason is the high number of tax-exempt institutions that use city resources but don't pay property taxes, including Northwestern University, several hospitals, and a high number of religious institutions (Evanston was once known as the "City of Churches" and has over 90 of them, in a city of about 75,000 residents). Because about 45% of Evanston's land is tax-exempt, the property taxes are shouldered by non-exempt properties, leading to higher rents and mortgages. There needs to be rent stabilizing or rent control for Chicago, or else we'll be like San Francisco. The South Side is losing population and you can buy empty lot in several wards for a dollar apiece. There are plenty of cheap places to live in the city if you don't want to live on the north lakefront or downtown. Rather than instituting rent control, why not work on making other parts of the city more attractive to live in? Rent control in an effective tool in helping neighborhoods preserve historic character and diversity, but it is not effective in ensuring sufficient affordable housing. San Francisco's housing problem is in large part due to a lack of housing period because it is so difficult to construct new high-density housing in many SF neighborhoods due to zoning constraints. Ultimately, prices go up when demand is larger than supply. Without adding new housing stock to match population changes, rent stabilization can lead to "slum lords" who refuse to give buildings proper upkeep (because it makes no economic sense to do so). If we want affordable housing in Chicago we should advocate for aggressively building more new housing in as many neighborhoods as possible. There's a reason why, in most neighborhoods, the main opponents to new high-density development are the wealthy "NIMBY" type--because adding housing stock lowers rents. Even without "rent stabilization", Uptown had and still has more than its fair share of slumlords. I still grind my teeth about having my property taxes in the form of Wilson Yard TIF money going to Voice of the People--so they could do all the repairs and remodeling on their Uptown tenement buildings they had put off for countless years, a parting gift and kick in the teeth of taxpayers from a departing Helen Shiller. The other thing that renters don't seem to understand is that landlords have to deal with ever-rising property taxes and building maintenance costs. No landlord is going to eat the cost of property taxes--and the $1400 in property tax I paid for my 2-bedroom condo in 1996 is now nearly $5000 per year. Add in the cost of building maintenance, garbage pick-up, water and sewer, building insurance, repairs, etc. and those costs together for one year are the equivalent of one year's total payments for a mortgage. If I was to rent out my condo, I guarantee you that I wouldn't ask for anything less than the total costs--I'm not going to subsidize someone's living arrangements. That's the reason rents keep going up--if renters helped to contain property taxes and other costs instead of turning the other cheek or actively encouraging increases (thinking they aren't really paying for them), rents probably would not be climbing exponentially. Supply and demand. Simple micro economics folks.